I’m excited to talk about my raw milk diet cure experiment. One of my favorite discoveries on my real food journey is raw milk. Last year, I was absolutely tickled to learn what a nourishing food milk could be under the right circumstances. You know when you read a piece of information and it just, you know… clicks? Well, reading about raw milk was a real “click” moment for me. I don’t know why. It just made pure and utter (udder?) sense to me that raw milk could really do a body good. So I spent some time perusing Realmilk.com, reading about the benefits of drinking real raw milk. And I was immediately taken with these decades-old stories of people who had been cured of a variety of ailments by going on an exclusive raw milk diet for several weeks. The idea of going on an all raw milk diet was very alluring to me, but I chocked it up as impossible since I didn’t think it was practical for me to consume only raw milk day in and day out. 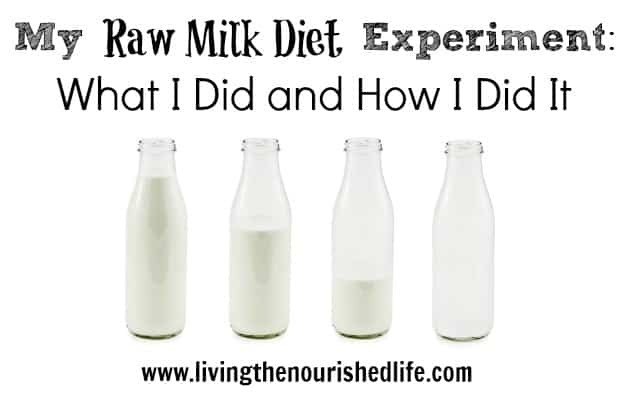 There is so much information about the milk diet, so today I just want to do an introduction to explain what the raw milk diet cure experiment actually is, because it’s a little more than just chugging milk all day. – Raw milk is a balanced, nutrient-dense food. It provides everything the body needs to rebuild and heal. Its liquid form is easily absorbed and digested by the body. – Raw milk should be taken in adequate quantities to provide the body with plenty of nutrients and rebuilding material, generally at least four quarts (one gallon) each day. – Milk should be taken in small amounts, sipping throughout the day to ensure proper digestion and assimilation of nutrients. No gulping large glasses of ice-cold milk, please. – Rest is highly recommended to ensure the body is focused on healing rather than expending energy. Someone who is ill should have complete bed rest for most or all of the diet. – Warm baths for relaxation, circulation and detoxification are also recommended. – Light exercise can be added to further improve circulation and body composition if you’re up to it. About 24.75 GALLONS of fresh raw milk! Or, nearly 60,000 calories on milk alone. That’s almost 99 quarts or just over a gallon every day. 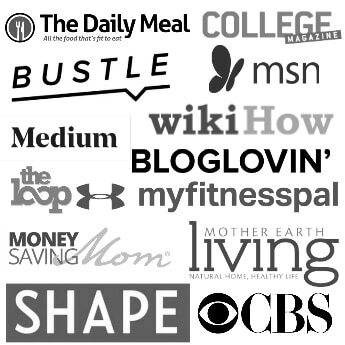 Being that I’m a 5’4″ woman of average weight, who exercises for about two hours a week (at most, and not even that much while on the milk diet), has a normal or even slow metabolism (I used to gain weight on 1,600 calories a day!) and essentially has a sedentary desk job, most nutrition calculators would recommend I eat about 1700-2100 calories each day to maintain my weight. So, if we’re going to succumb to the calorie counting theories, I should have gained about 3-5 pounds on this diet. However, I lost about 2-3 pounds. 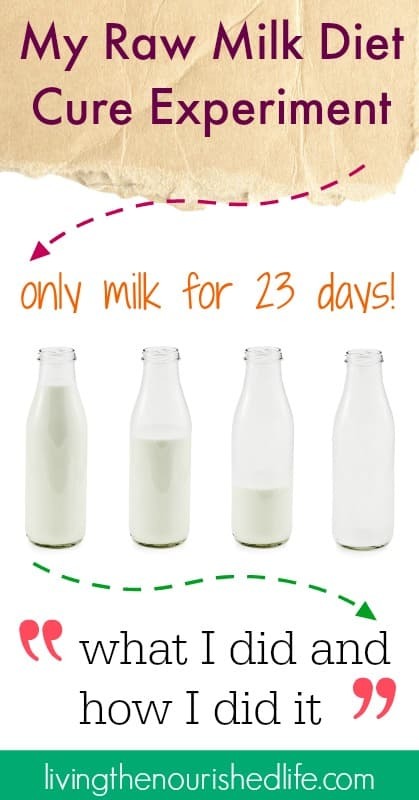 Read more about the milk diet and weight loss here. Well, I wish I could have gone on bed rest. What a healing ritual that would have been! But, alas, my household duties, my work, and my kids couldn’t be left to their own devices for over three weeks, so bed rest wasn’t really an option. I did, however, try to prioritize sleep and daily downtime. I spent extra time in bed when I could, and tried to minimize my stress (easier said than done!). I did do some mild exercise during the milk diet, though I really tried not to overdo it at all. If I do the milk diet again I think I will take this concept of bed rest more seriously. I probably won’t exercise at all, and try to limit more of my other activities as well. I think this is an important part of the healing process. I experienced very little of the typical bloating during the milk diet, but I did have problems with staying “regular.” So I deviated from the plan a little (which doesn’t include supplements) and took magnesium and vitamin C throughout the last 10-12 days of the diet to help move things along a little, so to speak. Read more about the milk diet and digestion here. This was so phenomenal. I had very few cravings on the milk diet. Occasionally I longed for some solid food like fried eggs with cheese, a burger or maybe a steak, but never enough to bother me. 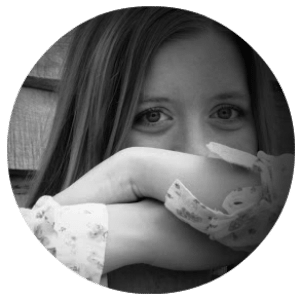 Amazingly, I had no cravings for sweets or even chocolate–and that’s my number one indulgence! Having no chocolate cravings through PMS was so unusual for me I never thought it would happen. So, I’m pretty certain that’s a testament to the milk diet if nothing else is! Read more about the milk diet, cravings and hormones here. C’mon, I know you’re wondering about something. If so, ask away in the comments below! Or, you can send me an email and I’ll be sure to answer all your questions in the posts following my break. Does the Raw Milk Diet Help You Lose Weight? I only just started reading your blog, so I may have missed something, but do you normally enjoy drinking a big glass of milk? I used to, with a PBJ, but that’s about it. Now we use raw milk and I can’t imagine a) affording it at $7/gallon, and b)drinking so much at one time. I don’t think I’d be able to choke down that much! Yes, I do like milk in general, so that really helped on this diet. However, I was pretty sure I was going to get sick of it after so many glasses, but right now I’m enjoying it as much as ever! Weird, huh? I chock it up to the fact that milk is so amazingly nourishing that my body just loves it, but who knows? This is so interesting especially your body temperature increasing and the calorie intake not causing weight gain. I’m fascinated. I just wanted to clarify that eating only 1600 calories a day actually causes your metabolism to lower itself. It doesn’t mean that it is naturally lower. For the most part, WE make our metabolism what it is. In general, it’s normal for a woman to eat around 2500 calories a day to support activity and a roaring metabolism. With a purposely slowed metabolism, you will easily gain wait when you eat more. This is something I knew but didn’t realize I was doing. I was so focused on eating perfect, traditional foods that I became stubborn and obsessive about food and wouldn’t eat enough. I thought the hunger discomfort was temporary but now I’ve been giving my body what it needs and healing for 10 months. I started recovery near my 30th bday and gained a lot of weight due to having lowered my metabolism which is hard to deal with since I was formally strong and fit, but also had a growth spurt in early recovery that I should have had years ago. Do not lower calories to lose weight; increase them (if you’ve been restricting) to lose fat. Otherwise you will lose fat… And muscle, and brain, and breast tissue, and pieces of your organs, etc. We need to stop listening to the mainstream, modern health and fitness fads (that don’t follow natural principles) and listen to our stomachs growling and our joints aching. *Word correction above: “weight” not “wait”. Oh, I also wanted to say that I did an adapted raw milk fast right before I began “self-taught and led recovery” from a damaged metabolism about a year ago. I drank mostly raw milk and homemade bone broth for several days. 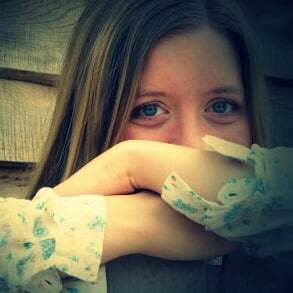 I remember feeling better physically (better for my then-weakened digestion and not so tired feeling) and emotionally better and not quite so stressed feeling. A few tips for the raw milk cure fast are to buy the milk during the time that the grass is growing more rapidly in your locale. This will make the milk even more nutritious. And drinking the milk at room temp will be easier on the stomach if cold milk bothers you. I can’t wait to hear all the details. I’m most curious about any changes you noticed in your skin/emotional functioning/energy level? Thanks for sharing your experience! Whoo-hoo! Congrats and good job, Elizabeth, for being our favorite raw milk guinea pig. I can’t wait to hear the details – especially the basal temp part. After hearing about this (from your facebook page) i decided to try this for 1 day. I was 3 pounds lighter the next day!!! I ordered a lot of extra milk for next week and i think i’ll slowly try this out. I had the most wonderful BM the day after (TMI i know) but it was great! Very cool! I swear this milk stuff can get addicting. If it was a little more affordable I might do it a lot more often. Oooh, I’ve been waiting to get the dirt on how this went! How was your skin is my big Q. The calorie part is amazing to me too. Since you mention PMS I wonder about your cycle itself- but maybe that is TMI (I’ve been eating NT for a month or two & finally had a cycle where I didn’t have to take ibuprofin to manage my cramping- I’ve made so many changes, not sure what to attribute it to). I think, if you do this again, it would also be really interesting to have your blood (i.e. cholesterol) analyzed before/after (since you’re consuming a lot of saturated fat). Somehow I think those numbers would be as amazing as the calorie intake! Thanks for all the input! Okay, I will definitely be doing posts on digestion, skin, energy, moods, PMS, menstrual cycle, basal temp, weight loss, and probably more. This is be covered over at least 3-4 posts in all, so in a couple weeks this blog will be teeming with milk diet results information! This is fascinating. I could totally do this as I have a good source for raw milk. Did you take a multivitamin or any other supplements during this time? Did you notice that it helped you with any health issues such as pms, acne, joint pain, fatigue, etc…. I stopped taking my usual supplements after the first day, because I really wanted to give the raw milk diet a run for its money, per se. I did start taking the vitamin c/magnesium about half-way through for digestion, though. Good for you! I’m so inspired! Now all you have left to do is get your own cow! I’ve had one for several years now and not only do I love her but I love not having to police milk rations! We may be getting a goat or two later this year so we can produce our own milk. I definitely think anyone attempting the milk diet should have as reliable a source as possible! I’ve been tracking my basal temp for over a year now and it’s a great indicator of what’s going on with the body. You probably know this already, but it really jumps up quite a bit after ovulation. Can’t wait to read your posts after the break! Yep, my temps did jump up around ovulation, but it was way higher than normal and my temps are still registering over 98.0 every morning. That’s one reason I wanted to do the milk diet for at least 3 weeks, so I could see the real effect of it during different parts of my cycle. Congrats! I am really looking forward to reading your upcoming posts re this experience. I don’t yet have a raw milk source, but the local health food store has agreed to purchase it within the next month or so. I keep bugging them. I hope that Whole Foods dropping their raw milk will not incourage others to do the same. I LOVE RAW milk! However, I have had trouble with milk all my life. My health has been very seriously bad. Born early. Got Polio from the vaccine at age 10. Now have fibromyalgia and Post Polio Syndrome and numerous health problems. Have improved greatly in many areas as I concentrate on healthful diet and supplements. However, I still have great difficulty with my digestion in spite of trying everything like acidophilous, papaya, yogurt, enzymes… Would this milk diet be a good idea for me or not? BTW- I had a horrible reaction to goat’s milk every time we tried it. I can’t tell you whether or not the milk diet will help. There seem to be mixed results. Some people experience great healing while others don’t do too well on it. If you do really terribly on milk then I would be careful. There are some stories about people overcoming lactose intolerance on the milk diet, but I don’t know too much about that myself. If you have a lot of trouble tolerating certain foods you might want to look into the GAPS diet. It’s a restrictive diet, but very healthy and eventually you get to introduce things back in. you should try yoghurt made at home with goat milk. Most people have problem with the the milk protein or milk lactose. By making yoghurt, you eliminate the lactose problem. Also digestion of curd takes very less time as compared to digestion of milk since curd is predigested broken down form of milk. Funny I stumbled on this. I’ve done mostly just fermented milk today for my calories. Cool experiment. I’ve thought about doing a raw milk diet myself, but it hurts the pocket book at $13-15 gallon around here. I’ve gone 3-4 and a few times 7 days on milk/kefir, but never more than that. Those were only 1/2 gallon or so days, as I was doing more of a protein sparing fast. Milk is inflammatory for me. I didn’t realize how much until I cut it out for a few months. I noticed a WHOLE bunch more after I was vegan for 6 weeks then added raw milk back to my diet. Holy knee stiffness! I do lots of exercise. Sometimes around 30 hours a week, so this wouldn’t be so much an issue if I was living normally. I love having the kefir in my diet though! It’s absolutely AMAZING for my gut health. Almost unbelievable. Ooh, yeah, the cost can be prohibitive. We’ve got $6/gallon here and it still adds up fast. Kefir is awesome. I’m big on probiotic foods right now, and kefir is an amazing one. The lactose in milk is definitely different than table sugar. It’s metabolized differently as well (from what I understand more like a starch). I can tell you that personally I didn’t get any blood sugar highs or lows despite consuming nearly 200 grams of lactose every day for several weeks. And this is coming from someone who has formerly had hypoglycemic tendencies. Personally, I did not react to the lactose like I do with refined sugar or flour. I’m an avid kefir consumer (used to use raw goat milk but these days using raw Guernsey milk that is striictly A2). Which may be something that people who struggle with even raw cow milk might look into – much of the dairy these days come from Holsteins and other A1 milk (even some Jerseys and Guernseys–although generally the best–are A1 so you have to ask). Anyway, almost everyone who switches to A2 (having to do with the protein type, since bad breeding practices designed to increase milk volume caused the A1 type to appear) tend to lose lactose issues and other digestive problems. Anyway, enjoying the reports so thank you, Elizabeth! Great points! I know a lot of people can consume kefir who can’t tolerate milk too.